The Review and Refresh session – part of the package! 23rd January 2017 - The Review and Refresh session – part of the package! We know you are very familiar with the 3 half-day training sessions that all Catch Up® deliverers have to complete in order to be able to use the intervention to support learners, but have you attended any other parts of the training package yet? The ‘Review and Refresh session’ is a training event available to all Catch Up® trained staff, at no additional cost! The Review and Refresh session has been designed to do exactly what it says! It provides an opportunity for you to ‘review’ your Catch Up® delivery so far and/or to ‘refresh’ your understanding of the Catch Up® intervention and process. There is a Review and Refresh session for Catch Up® Literacy and one for Catch Up® Numeracy. Attendees always find it very useful to share good practice and ideas with colleagues, as well as being able to clarify points with a Catch Up® Accredited Trainer – and pick their brain, on occasion! Catch Up® deliverers can attend as many Review and Refresh sessions as they would like, any time after they have been delivering the intervention for a while. Visit your nearest Regional Training Centre page to see dates and log in to reserve your place! During the Autumn Term 2016, our Catch Up® Accredited Trainers were delighted to deliver these sessions across the UK (mostly at our Regional Training Centres), welcoming back familiar faces and hearing about the fantastic work going on across the Catch Up® Community! We are always so impressed with the professionalism and dedication of those delivering the interventions, which results in terrific progress being made by the learners! One of our trainers, Lynne Startin, has run these sessions for both Catch Up® Literacy and Catch Up® Numeracy during the term. She told us it has been a pleasure to meet up once again with Catch Up® deliverers and hear about the successes and achievements of Catch Up® learners. Lynne explained that she has been able to tailor the content of the sessions to suit the needs of the different groups, with popular topics including timetabling, resources, monitoring progress, moving a learner onto the next Catch Up® level and the importance of effective implementation/coordination of the interventions. She recalled one particular discussion about timetabling: “One LSA delivered Catch Up® before school, and during lunchtime, which suited their situation perfectly. This caused interest in the group and led to some good discussion on ‘when is Catch Up® delivered’.” Other deliverers Lynne met had completely different timetable arrangements – all appropriate to their settings, but with the shared understanding that the two 15-minute sessions a week were key, regardless of when they took place. 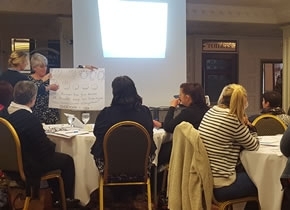 Lynne told us that attendees found the opportunity to share ideas and refresh their understanding of the Catch Up® process really helpful, for example, when to introduce a learner to phase 2 of Catch Up® Numeracy. Attendee feedback certainly reflected this, with comments being received such as: ‘It was great to have this session. It has helped me to refresh and ask questions on aspects I was less confident with’, and ‘…useful, in-depth training, to support my delivery’. Look out for a Review and Refresh session at your nearest Regional Training Centre; the sessions are running at different locations over the next two terms. Remember, you can also contact the Catch Up® office team directly, to find out when one of these training sessions is planned near you. Attending a Review and Refresh session is part of your training and support package, so don’t miss out! We look forward to seeing you and hearing about the fantastic work you are doing!